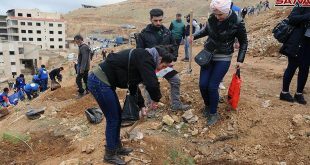 Damascus, SANA- A celebration was held on Thursday on the occasion of the 67 anniversary of Tree Day in al-Jisr al-Sabe’a area at Damascus International Airport’s road. 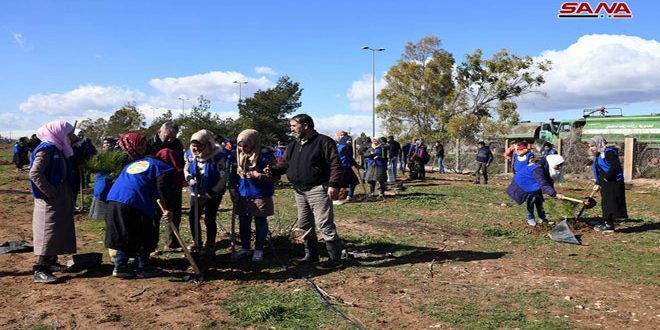 An afforestation campaign to plant an area of 10 hectares with 5000 tress in Damascus International Airport’s road was launched during the celebration , which will last till the end of next March. It aimed at expanding green areas and re-planting degraded and burned forests ,and maintaining the sustainability and continuity of forests productivity , in addition to focusing on the economic and environmental gains of the forest. Minister of Agriculture and Agrarian Reform Ahmad al-Qadiri said that the Ministry seeks to rehabilitate all the afforestation areas which have been cut, burned, and vandalized, as a plan was put for the coming stage focusing on these areas as a priority in order to meet their agriculture needs. He pointed out that the afforestation campaigns will cover all the Syrian provinces in an attempt to restore vegetation cover in the country.